It'll be 9-12 months before I begin House Concerts because I have to develop my show. But I am doing all of the planning in advance. My question is this: I keep reading about people mentioning donations of $20. I would assume that most of the Guests, including the Host, will be couples. So, if there are 20 guests and only the one person of the couple who is handling the couples money, makes a donation of $20, then that is only $10 per person, which is very little to pay for a private intimate professional concert. Am I right in assuming that the $10 per person ($20 per couple) is about what to suspect? If so, then that would only be $100, which would barely cover one days travel, lodging, eating expense. (14 Dec 2018, 07:12 PM)BillyT Wrote: It'll be 9-12 months before I begin House Concerts because I have to develop my show. But I am doing all of the planning in advance. Hey Billy! This is a good question. I have a couple of thoughts. First, with this model, you're playing the averages. Some people will be in a position to be generous and will be very moved by your performance; they will bring your nightly donation average up. And then some people may be in a poor place in their life, or perhaps didn't manage to connect with your performance, and they may bring your average down. Anyway, our average per-head donation on this last summer's tour was $16. That's not a crazy high number! It's not even $20 per person. But our average nightly income was $701. So, how did we do this? 1) Getting a few more people to the shows. We had an average per-show attendance this year of 25 people. 25 people multiplied by $16/head = $400 in donations per night, on average. If you work with your hosts to help them stoke interest for the show, they will get more people there. Also, your audiences will grow over time, as you grow what you do. We've been doing this for a long time, which is why our per-show attendance average is a little higher; when we were starting out, our average was more like 15 people per show. And, remember, that $400/night donations figure is an average. Most nights we had a $50 or $100 bill in the donation vessel. That's one of those "in a position to be generous" people, helping cover for the people who didn't or couldn't pitch in. 2) Merch. We did an average of $13/head this year in merch. If you multiply this by 25 people, that's about $325 per night in merch, on average. I also want to point out that you made a simple math mistake in your post. In your example, with 20 people there, each donating $10 on average, you would make $200 in donations, not $100. And this is without selling any merch! If you sell a $10 CD to 5 people, you've made $250 for the night. Subtract the $100 per day in expenses that you think you would have, and you would have $150 in profit per night. 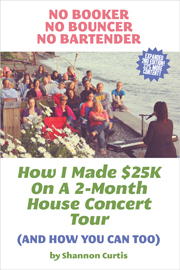 As a point of reference, Shannon and I averaged about $300/night on our first little house concert tour, which is a very similar number, especially considering that we have two people's worth of expenses. Does this feel a bit more doable now? I hope it does! Thanks for the good question; we're glad you're here.